We all saw this coming didn’t we? 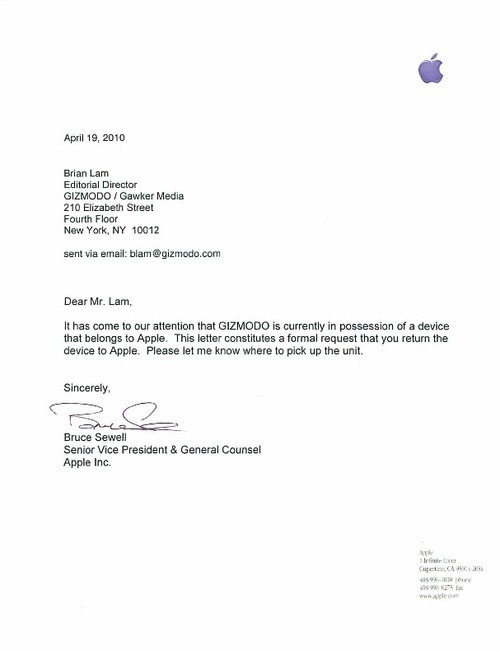 Apple apparently has sent an official letter to Gawker Media – the company which runs Gizmodo blog, requesting them to return their “secret” handset. The letter was signed by Bruce Sewell, the Senior Vice President & General Counsel of Apple Inc and can be seen as attached below. In case you were living under a rock or something, and have missed the entire “lost/stolen” iPhone 4G saga, you can catch up on all the event as they happened (in reverse chronological order) by following the links given below. for what the hell they want the iPhone back?, they are just using the media to keep people interested in iPhone related news. Ofc they are and they properly planted it there in the first place to get free publicity honestly with this comunity they couldnt get more and bether publisity then that, and they might still improve upon the prototype with all the feedback from people. I for one hope they toss that hedious design and adopt something thats more like a iPad mini cause that is awesome – i dont mind the black back but i do mind the brick like design they seem to have adoptet. Ofc it might feel diffrent once i have it in my hand and as it is a iPhone even if it looked like a rubber chicken i would still buy it cause its the best smartphone product on the marked. Can they identify it and prove that it is theirs with some type of detail that has not been reported about? Apple is such an attention seeking w_hore! all this news about lost iphones and all is just free advertisig. secondly apple is so sevretive about everything just as the dev deam and the people who finally made spirit. everyday you keep seeing blogs asking, pleading, begging to release an unlock for the 3.1.3 They DO have it but they too are no different than apple. these teams of hackers who say stop bugging them for an unlock is just so carzy and just as secret as apple. we all know no matter what apple throws at us in updates, there wil always be jailbreaks/unlocks for them. now apple has released the new ipad and the dev team and others said after that happened they would release an unlock for us. ok WHERE the heck is it??? I for one am so tired of checkind day after day on the web loking to see if they released it yet but no. I even donated alot of money to these guys for it!! !